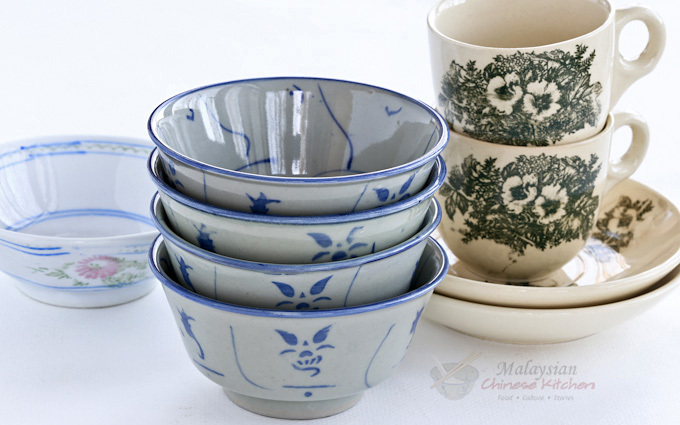 Malaysian Chinese ceramic ware has been an important part of how the food was presented in family dining. Different types wares were used for different occasions. Once upon a time, the simple family dinner was served using all kinds of bowls and plates adorned with traditional Chinese patterns today commonly referred to as Kitchen Qing. These kitchen ware range from simple blue-and-white “fish bowls” with the pattern of a curled carp at the base to the most florid Chinese rococo patterns complete with dragon and phoenix motifs. 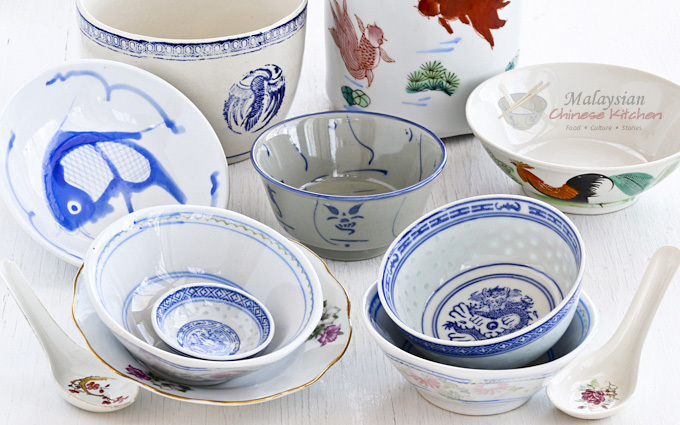 These were imported from China’s Jingdezhen porcelain works. 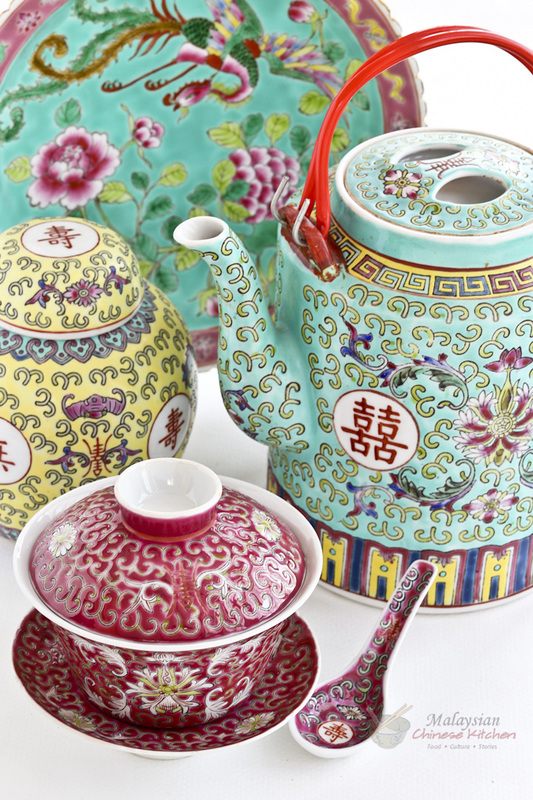 At its height, specific pastel colors favored by the Malaysian Chinese were specially made. With the modern onslaught of the dreaded bright orange or green melamine ware, these refinements are just a distant memory for many of us. 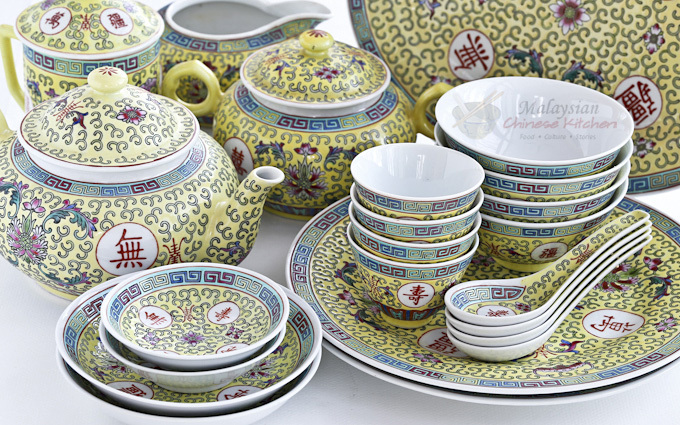 Most Malaysian Chinese families maintain two sets of dinnerware. The plain everyday ceramics were normally just white ceramics with patterns around the edges. The most popular patterns were the “ko-ko-kei ua” or cockerel motif, hibiscus, or the tea rose. These were the workhorses of the Malaysian Chinese kitchen, providing the backdrop for the multitude of dishes served every day. The daily plates normally have flashes of green (life) and red (prosperity) as these are considered auspicious colors and most suitable for the family meal. In later years, with the use of ceramic decals, pink became popular as well. The other set of Kitchen Qing were reserved only for festival days. These tend to be heirloom pieces inherited from parents received during the couple’s wedding day and are carefully kept in a display sideboard cabinet. Among affluent Peranakan families, such heirloom pieces are rich in pastel colors (pink, turquoise, green) with very ornate scalloped edges complete with phoenix patterns. Sinkeh families favor the Ban Siew sets that are equally ornate decorated with auspicious Chinese characters. All these pieces are now highly sought by collectors and are worth far more than the original owners could imagine. Among the less affluent, blue-and-white ceramics are often reserved for festival days. Among these, the “batik ua” pattern, a dense blue and white pattern that resembles the artwork on a sarong is much prized. Another pattern that was also pretty popular was the “leng ua” or dragon motif. 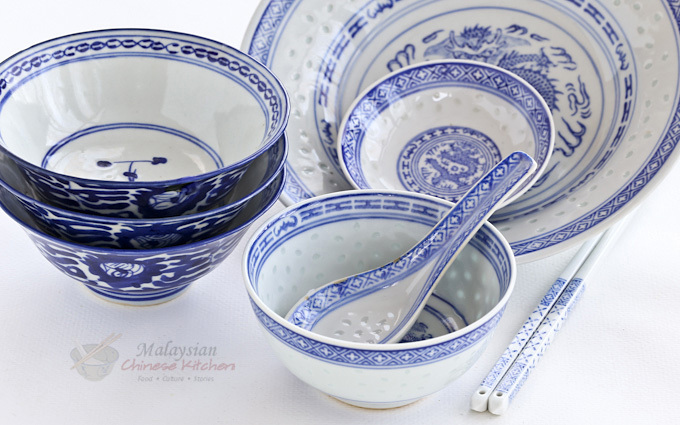 Among the richer Peranakan families, blue-and-white ware were only used for funeral occasions or “serving the ancestors”. These patterns were also pretty popular with restaurants. I remember those years when our family went out for dinner after a long weekend trip to the city and I would be very sleepy by then. Through my sleepy stupor I would glance at the table, with the server would start tossing out these plates with either the blue-and-white dragon motif or a similar stylized phoenix motif. I have always since associated these plates with eating out. The final category of Kitchen Qing that I would like to relate are these curious associations that people have of certain bowl patterns with specific street food. Some of us may remember the “laksa ua“, a blue-and-white ceramic bowl with very steep sides, smaller than the usual noodle bowl that was often used to serve Penang Asam Laksa. Another one is the “tok-tok mee ua“, a white bowl adorned with a few goldfish (at least that’s what they appear to be, normally pretty scrubbed out over years of use) associated with the Wonton Noodles soup seller. Last but not lease was the classic “pe’ kak ua” or octagonal shallow rice bowl used to serve rice or congee. And who among us can forget the “kopitiam” (coffee shop) cups and saucers with their signature green floral patterns used to serve up everything from “kopi-o-kao” (a version of expresso in modern parlance) to “hengjin lo pek” (an almond powder drink). Many of the more high-prized Kitchen Qing pieces are now only seen in museum displays or private antique collections. I can almost imagine my late grandmother exclaiming in shock if she were to know how expensive these pieces have become in the 21st century. As for the more “common” varieties, they have been lost over the years as people threw out old pieces and replaced them with modern branded ware, so much so that these have also become collectible for nostalgic value. Recently on a trip back to Georgetown, I spotted a row of “ua-chan” or tiffin carriers at an antique store. I remember these from the days of yore when my Mom would fill these with Nasi Kunyit (steamed glutinous turmeric rice). Now they are rare and cherished precisely because of those memories. Awesome write-up. Now I know the history behind the different patterns. There is so much history in these everyday kitchen ceramics, and so much of it went by without people noticing. Paul found out a lot from my late mother-in-law years ago. Thanks for visiting! Great work & write up, Linda & Paul! Brings back lots of memory just by looking at those bowls!! I am looking to purchase the blue carp fish plates diameter is 19-20cm.could you kindly tell me where can I buy them.they are made in China. Thank you. I purchased the ones I have a long time ago in Petaling Jaya, Malaysia. You may still be able to find a few pieces from those small shops selling dishes in and around Kuala Lumpur. Thankyou so much for peoviding such a wonderful website. I am enjoying it very much. I have a couple of the Cockerel motif design bowls that I purchased many years ago in Sydney. I have recently been searching for more but have had no luck. They are just magnificent to eat from!. Do you have any advice on how I can find more? You are very welcome, Jackie! Many thanks for you kind words. You can buy most of the crockery shown except for maybe two types at reasonable prices, except the batik bowls and the Nonya Peony Shanghai bowls and plates. The octagonal hawker bowls are rare but the rounds are still being made. 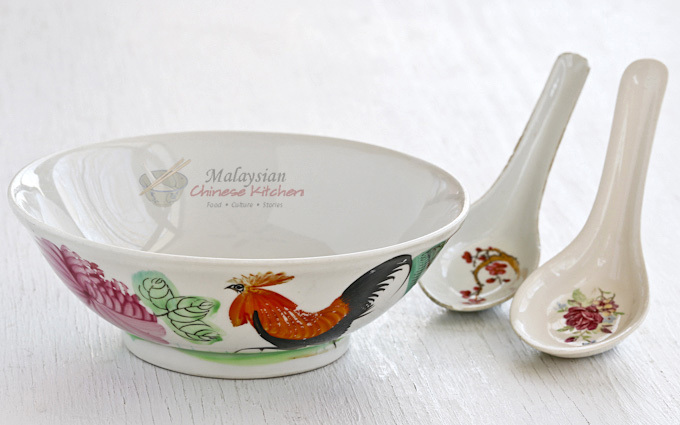 The ban siew designs can still be bought at reasonable prices in Penang and KL and Singapore in difference colours and so are rice grain bowl (you call leng ua). Laksa bowls are also available. What is rare are those with two stacks of designs instead of one stack shown in your photo. I haven’t seen the two stack laksa bowl design in ages. Maybe back in the 1970’s at the Kuantan Road market stall. Would love to get a picture or even better, a specimen. Batik bowls shown here are late 19th century. Peony Shanghai can be found in antique stores at prices much higher than originally purchased. Red Bansiew are definitely more abundant, the design has been copied by melamine ware, which is a cheapening effect on a nice on design. But if you look carefully, there is a difference in the quality of the finish of the older red ones in the foreground (early 20th century) with the yellow and turquoise ones from the mid 20th. Leng ua is also abundant, but the quality has been slipping over the decades. Recent “fish bowl” design are even worse, with the pattern clearly a decal without the charming brushstrokes of yesteryear. Please advise where we could buy the yellow ban siew in Singapore. My mum will be celebrating her 90th birthday and she would want to give sets of ban siew to her children and grandchildren. Congrats to your mom on her 90th. Truly “ban siew”. Do you know where I can get old enamel tiffin carrier in kuala lumpur ? You may stand a better chance of getting them in Melaka or Penang. Thank you Linda and Paul for providing such an informative and interesting website Discovered your blog while searching for recipes for salted egg. Keep up the good work. I enjoyed your blog entry very much. and the red ban siew, for normal everyday use ? Hi Linda! I desperately need your help! My mom and I found some beautiful yellow ban siew dishes at the thrift store but I don’t know what all the many bowls and plates and cups are used for or if this is even authentic chinaware. Can you help? I am very interested int he “Batik Ua” and am wondering if you could kindly point to me any site that I can visit and learn more about them. I do remembered my aunt in Penang will used them when she has special occassion like the times when she has to cook and served the food in the “Batik Ua” to our ancestors. Any information would be much appreciated.